An updated version of this porting guide is now available in the bb-runtimes repository. As a first article (for me) on this blog, I wanted to show you how to adapt and configure a ravenscar-compliant run-time (full or sfp) to a MCU/board when the specific MCU or board does not come predefined with the GNAT run-time. To do so, I will use GNAT GPL for ARM ELF and 3 boards of the same family: the STM32F429I-Discovery, the STM32F469I-Discovery, and the STM32F746G-Discovery. They're fun to use, with lots of components to play with (exact features depends on the board): LCD, touch panel, audio in/out, SD-Card support, Networking, etc. They are from the same manufacturer, so we can expect some reuse in terms of drivers. The first one (STM32F429I-Disco) is already supported by default by the GNAT run-time. We can start from there to add support for the other boards. Instructions, architecture are MCU specific. GCC is configured to produce code that is compatible with a specific architecture. This also takes into account specific floating point instructions when they are supported by the hardware. Initialization of an MCU is specific to a family (All STM32F4 share the same code, the F7 will need adjustments). The interrupts are MCU-specific, but their number and assignments vary from one minor version to another depending on the features provided by the MCU. Memory mapping is also MCU-specific. However there are differences in the amount of available memory depending on the exact version of the MCU (e.g. this is not a property of the MCU family). This concerns the in-MCU memory (the SRAM), not the potential external SDRAM memory that depends on the board. 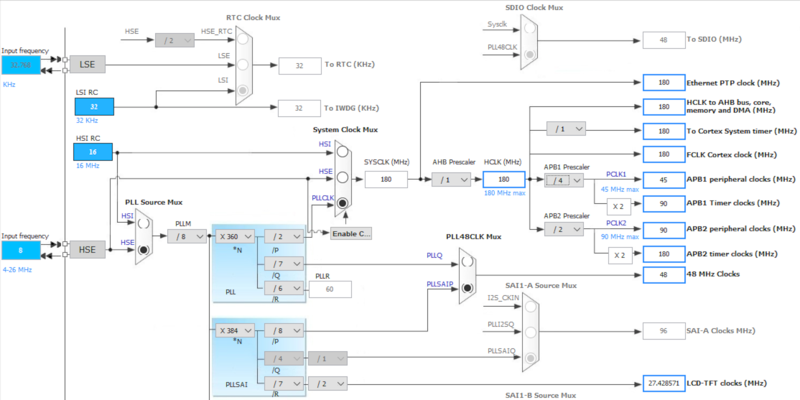 Most clock configuration can be made board-independant, using the MCU's HSI clock (High Speed Internal clock), however this is in general not desirable, as external clocks are much more reliable. Configuring the board and MCU to use the HSE (High Speed External clock) is thus recommended, but board-specific. Adapting the startup code in case of a major MCU version (STM32F7, that is Cortex-M7 based). Checking and defining the memory mapping for the new MCU. Checking and defining the clock configuration for the specific board. Make sure that the hardware interrupts are properly defined and handled. To follow this tutorial, you will need at least one of the boards, the stlink tools to flash the board or load examples in memory, and GNAT GPL for ARM (hosted on Linux or Windows) that can be downloaded from libre.adacore.com. Install it (in the explanations below, I installed it in $HOME/gnat). The GNAT run-times for bareboard targets are all user-customizable. In this case, they are located in <install prefix>/arm-eabi/lib/gnat. The board-specific files are located in the arch and gnarl-arch subfolders of the run-times. If everything goes fine, then a new ravenscar-sfp run-time should have been created. As it has been created directly within the GNAT default search path, you can use it via its short name (e.g. the directory name) just as a regular run-time: by specifying --RTS=ravenscar-sfp-stm32f469disco in gprbuild's command line for example, or by specifying 'for Runtime ("Ada") use "ravenscar-sfp-stm32f469disco"' in your project file. Now we're ready to start the real thing. Next, we need to find the technical documents that describe the MCU. Go to http://st.com and search for "stm32f469NI" (that is the MCU used by the discovery board), and once in the product page, click on "design resources" and check the RM0386 Reference Manual. From the chapter 2.3.1, we learn that we have a total of 384kB of SRAM, including 64kB of CCM (Core Coupled Memory) at 0x1000 0000 and the remaining at 0x2000 0000. Additionally, we need to check the flash size. This is MCU micro version specific, and the specific MCU of the STM32F469-Disco board has 2 MB of flash. The STM32 reference manual tells us that this flash is addressed at 0x0800 0000. The run-time is responsible for initializing the system clock. We need the following information to do this - the various clock settings that are available, and the main clock source. To properly setup the values, we now need to check the speed of the HSE clock on the board. So back to st.com, search for STM32F469-Disco, and from the product page, download the board's user manual UM1932: Discovery kit with STM32F469NI MCU. From chapter "6.3.1 HSE clock source" check that the HSE clock is running at 8MHz. arch/s-stm32f.ads define some of the MCU's registers, as well as Device ID constants. Start by adding the STM32F46x device id in s-stm32f.ads. You can search google for the device id, or use st-util to connect to the board and report the id. We see in s-bbpara.ads that the HSE is OK (we fall in the 'others' case). However the Clock_Frequency constant can be bumped to 180_000_000. Looking now at setup_pll.adb, we can verify that this file does not require specific changes. PLLM is set to 8 to achieve a 1 MHz input clock. PLLP is a constant to 2, so PLLN is evaluated to 360 to achieve the expected clock speed : HSE / PLLM * PLLN / PLLP = 180 MHz. --  and table 15 p79). On the stm32f4 discovery board, VDD is 3V. --  Setup internal clock and wait for HSI stabilisation. The available interrupts on the MCU can be found in the Reference Manual. However, an easier and better way to get the list of interrupts is by generating the Ada bindings from the CMSIS-SVD file for this board using the svd2ada tool that can be found on GitHub, and by downloading the SVD file that corresponds to the current MCU (STM32F46_79x.svd) directly from ARM. This binding generates the interrupts list and we can then check the ones that are not mapped by the current run-time. A total of 91 interrupts are defined by the MCU, with an additional 2 required by GNAT (Interrupt Id 0 is reserved, and GNAT maps the SysTick interrupt to Id 1). The necessary job has now been done to support the STM32F469I-Disco. You can now install the run-time, and use it with the examples from our bareboard drivers repository on GitHub. Note that, as of the time when this article is written, only the 'svd' branch includes some drivers support for this board. Now on to the STM32F7. This is going to be a bit more difficult for one reason: the STM32F7, being based on the Cortex-M7, can now benefit from Data and Instruction caches. These caches need explicit initialization. A minimal support for the STM32F7 already exists in the run-time, but it is incomplete as these caches are not properly initialized. First of all, let's create the new run-time for this board. We'll start this time from the work previously performed for the STM32F469-Discovery board to speed up the process. Initialization of the cache is described in details by ARM in the Cortex-M7 processor technical reference manual. This file initializes the FPU, the data cache, the instruction cache (according to the ARM documentation), as well as the TCM memory. We now need to call it from the startup files, start-ram.S and start-rom.S. Clocks, interrupts, linker scripts, etc. In s-stm32f.ads, DEV_ID_STM32F7xxxx is already defined. In s-bbpara.ads, the HSE clock is also properly set to 25MHz, the MCU can run at 216 MHz, but STM32CubeMX shows some issues with such value, so we simplify by using a 200MHz value. The interrupts are very similar between the STM32F746 and the STM32F469, so you can benefit from the changes already performed. Et voilà. Now you can rebuild the run-time, and test it similarly to the stm32f469-disco. You will find below the source files for the runtimes. 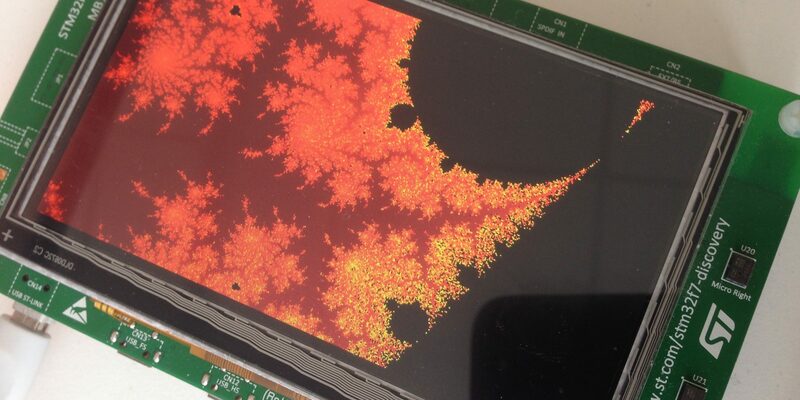 Although part of the initial run-time for the STM32F429-Disco is delivered with GNAT, it is not necessarily well optimized (some missing interrupts and a non-optimal clock speed in particular). So I included the sfp and full ravenscar run-times for it as well in the final source packages. Also, in the attached source package, I made use of extending projects to adjust the runtimes. The setup is a bit complex so I haven't explained it above as this is not really part of the subject, but you can have a look if you want. By using extending projects, the advantage is that I only needed to add the files that I'm actually modifying, and thus can more easily benefit from a futur upgrade of GNAT. Finally, in the downloadable sources, I got rid of the 'BOARD' scenario variable, as the runtimes are now board specific: such scenario variable is only useful when supporting a complete board family. To go further in customized run-time, you can refer to the following documentation: Customized run-time. Jerome Lambourg is a senior engineer at AdaCore. After graduating from the french High School Telecom ParisTech in 2000, he worked first for Canal+Technologies, and then as a consultant for General Electrics Medical Systems, SAGEM Mobile, and Thales Naval. He then joined AdaCore in 2005. There he worked on various parts of the technology: GPS, GNAT Pro for .NET, AUnit, certification tools (the Qualifying Machine). He is now involved in cross and bare metal platforms, in particular as product manager of GNAT Pro for VxWorks.